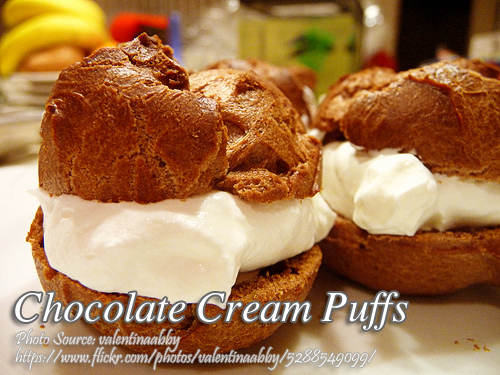 This is a unique way of making cream puffs, these chocolate cream puffs filled are with cappuccino cream. If you are looking for a cream puff recipe and wants to impress your friends or family or just want to make something different. Position rack in center of oven and preheat oven to 450 °F. Lightly butter and flour a baking sheet. In a medium saucepan, combine water, butter, chocolate and salt. Cook over medium-low heat, stirring constantly until butter and chocolate are completely melted. Increase heat to high and bring mixture to a boil. Remove from heat and stir in flour to make a smooth paste. Return pan to stove and stir vigorously over medium heat for 1-2 minutes until paste forms a solid mass that comes away cleanly from sides of pan. Transfer paste to a large bowl. With a handheld electric mixer set at low speed, gradually beat in all but 2 teaspoons of the beaten eggs (reserve to brush on cream puffs before baking). Dough should be thick and smooth. Drop 10 heaping spoonfuls 2 inches apart on prepared baking sheet. Lightly brush with reserved beaten eggs. Bake for 15 minutes, then reduce heat to 375 °F and continue baking 20 - 25 minutes more, until tops have browned and feel firm to the touch. With a cake tester or toothpick, pierce each puff a few times. Dry puffs in hot oven with door slightly ajar for 20 minutes. Transfer to wire rack and cool completely. Remove top third of each puff and fill with Cappuccino cream. Replace top and sprinkle lightly with confectioners' sugar and cinnamon. In a small saucepan, soften gelatin for 1 minute in ½ cup of water. Cook and stirring constantly over low heat, unit gelatin is dissolved and mixture is transparent. Remove from heat. In a large metal bowl, combine coffee powder with ½ cup of boiling water, coffee liquor and vanilla. Add hot gelatin mixture, stirring frequently for 10-15 minutes, just until mixture begins to thicken ( it should have the consistency of raw egg whites). Remove bowl from ice water. In a medium bowl, whip cream with wire whisk until soft peaks form. Fold into coffee mixture. In a large bowl, beat egg whites until frothy with a hand held electric mixer set at low speed. Add cream of tartar and gradually increase speed to medium-high. Slowly beat in sugar, a teaspoon at a time, until stiff, shiny peaks form. Fold beaten whites into coffee cream mixture.